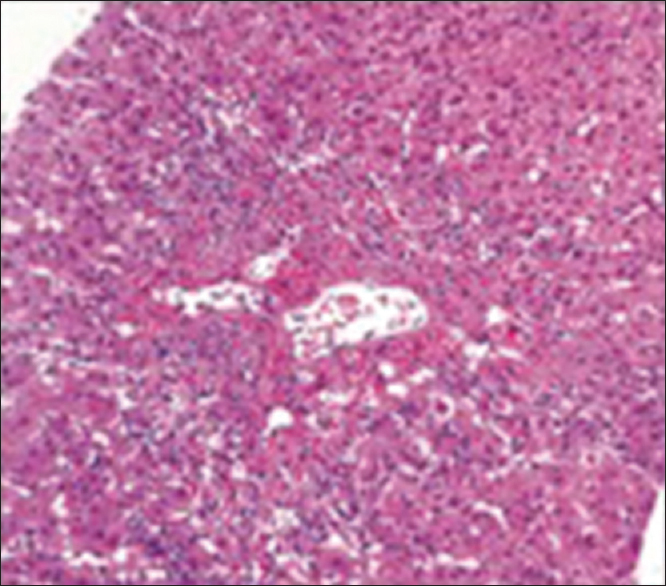 Posttransplant liver biopsies (PTLBs) form a cornerstone in the management of transplant cases. They provide critical information regarding rejection or reoccurrence of diseases. Previously, many centers were used to perform protocol biopsies at 0, 1, and 6 months to look for graft dysfunction and to predict dysfunction at a preventable stage. Currently, in most centers, biopsies are performed only when indicated. The interpretation of PTLB is an essential part of surgical pathologist trays these days and can guide therapy in many ways. This review aims at understanding of posttransplant liver pathology with an insight into 2016 Update of the Banff Working Group. Trends of liver function test. Late graft dysfunction: Occurring >2-month posttransplant. It mostly occurs due to perfusion-reperfusion injury (PRI), antibody-mediated rejection (AMR), small for size syndrome, T-cell-mediated rejection (TCMR). It is injury occurring to graft during the period of preservation of graft. The graft undergoes three phases of perfusion injury as cold and warm ischemia (while it is harvested from donor) and reperfusion injury (during revascularization in recipient). Maximum injury occurs at the time of reperfusion because of formation of free radicals. A drop in mean arterial pressure >30% below the baseline value, lasting for at least 1 min, occurring during the first 5 min after reperfusion of the liver graft (unclamping of the hepatic hilum) frequently results in PRI. 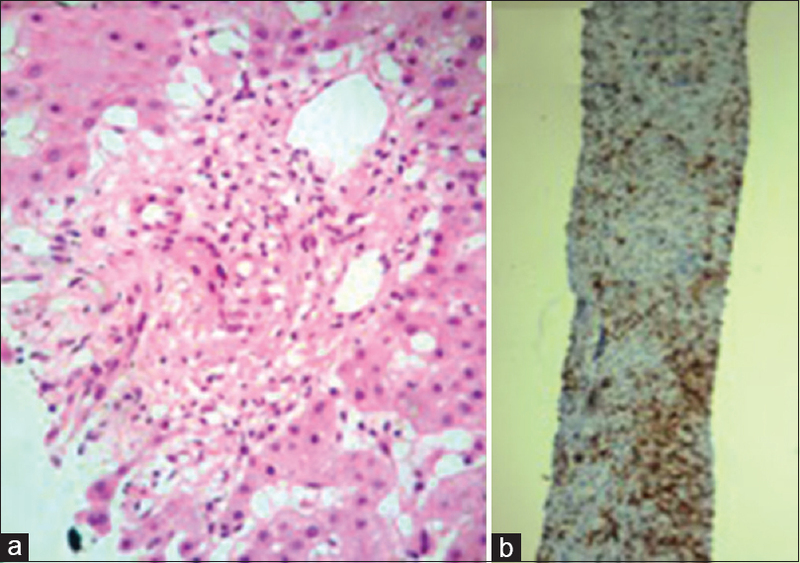 Histological indicators show marked hepatocyte ballooning/apoptosis, neutrophilic aggregates, and cholangiolar cholestasis [Figure 1]. It is usually seen in hemolytic disease of the newborn, ABO incompatible (ABA-I) grafts rarely in ABO-compatible grafts. It presents with graft dysfunction within the first 2 weeks of transplantation mostly within 1–2 days in a host with preformed antidonor antibodies. Clinically, it shows marked rise in gamma-glutamyl transpeptidase with or without aspartate transaminase/alanine aminotransferase elevation along with gradual increase in bilirubin. 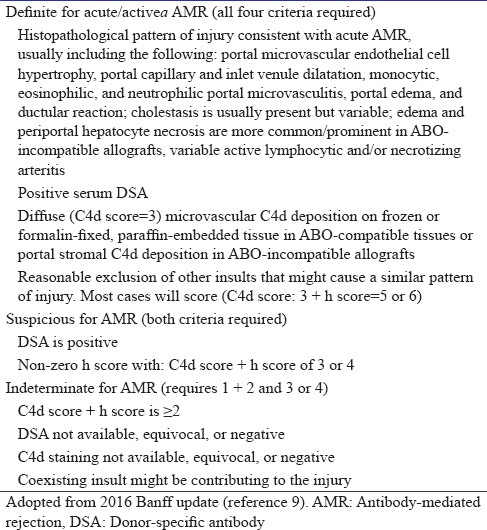 The criteria for AMR are now being reclassified by the 2016 Banff update with histopathology score and C4d score performed on formalin-fixed tissue [Table 1]. Based on combined h and C4d scores together with donor-specifi c antibody testing criteria for AMR are given as shown in [Table 2]. Widespread neutrophilic exudation, congestion, portal hemorrhage and coagulative hepatocyte necrosis leading to massive hemorrhagic necrosis. 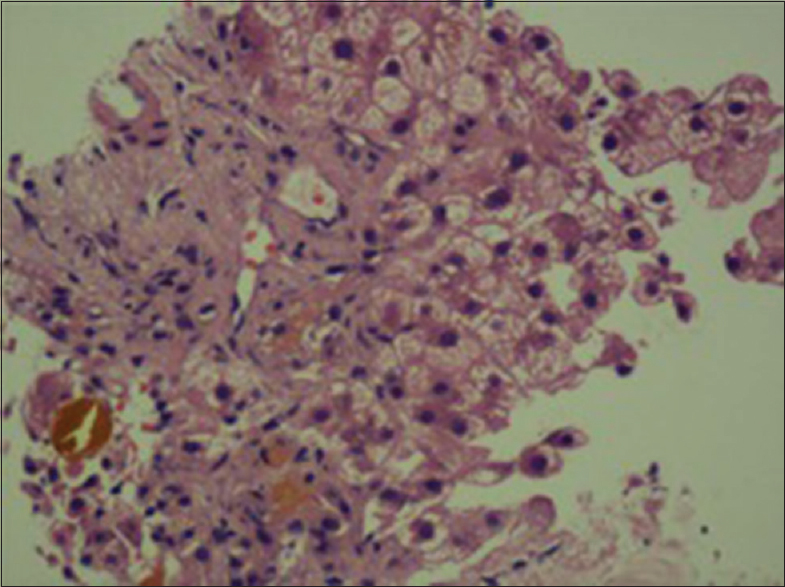 There are bile ductular proliferation and neutrophilic cholangitis mimicking histology of biliary obstruction. 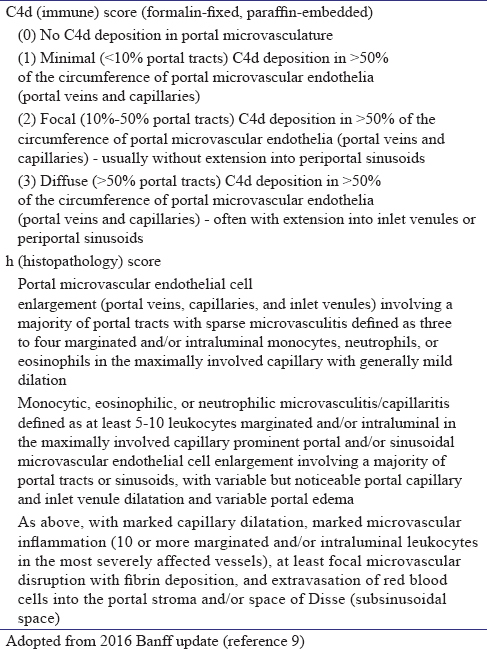 Linear to granular deposition of C4d on portal vein, capillary, inlet venule, focally within sinusoids and central vein [Figure 2]. Deposition in elastic lamina of arteries, portal and perivenular elastic fibers, and necrotic and steatotic hepatocytes is a nonspecific finding and should be ignored. Diffuse deposition in >50% portal tracts in >50% circumference of portal microvascular endothelium is regarded as a diagnostic pattern in an ABO incompatible graft. For successful transplant, donor graft-to-recipient body weight ratio should be (acceptable >0.6, preferably >0.8%). Remnant liver in donor should usually be >30%. If graft size is small compared to recipient weight, there will be portal hyperperfusion. Portal hyperperfusion leads to portal vein and periportal sinusoidal endothelial denudation. Clinically, a patient presents with rising bilirubin, ascites, and coagulopathy. 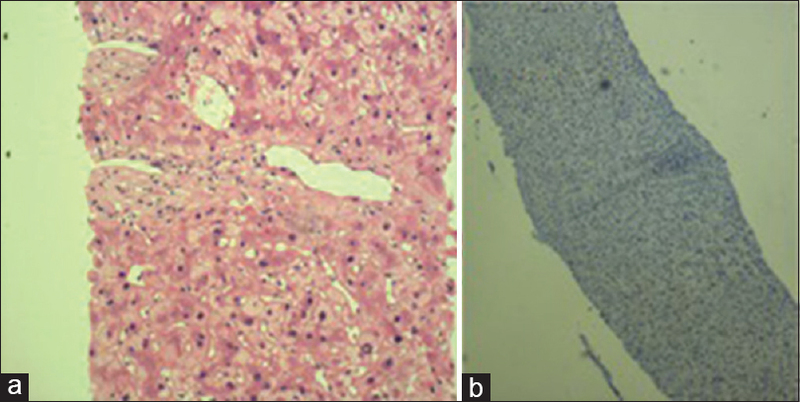 Hepatocanalicular cholestasis, steatosis, hepatocyte atrophy and sinusoidal endothelial denudation. TCMR is diagnosed in 30%–60% of liver recipients and typically occurs within the first 30 days following liver transplantation. It is a most common form of liver allograft damage and will rarely cause graft loss. Histologically, changes are noted mainly at three regions – portal tract, venous endothelium (portal and central vein), and bile duct. Portal tract shows mixed inflammation comprising mainly T-lymphocytes, eosinophils, and activated blasts. Bile ducts and veins show signs of damage by these inflammatory cells called ductulitis or “endotheliitis” or “endothelialitis” [Figure 3]. The degree of infl ammation at these three sites is graded as per Banff criteria to get an index called rejection activity index (RAI) [Table 3]. Based on RAI calculated, the rejection can be graded as mild (RAI – 3-4), moderate (RAI – 5, 6), and severe (RAI − >6). It occurs usually more than 6-month posttransplant. Cases of late TCMR usually present with raised transaminase levels instead of cholestatic liver biochemistry. These cases are associated with increased frequency of adverse outcomes as progression to chronic rejection (CR)/graft loss. Biopsy shows mainly perivenular changes called central perivenulitis (CP) and less of portal changes. 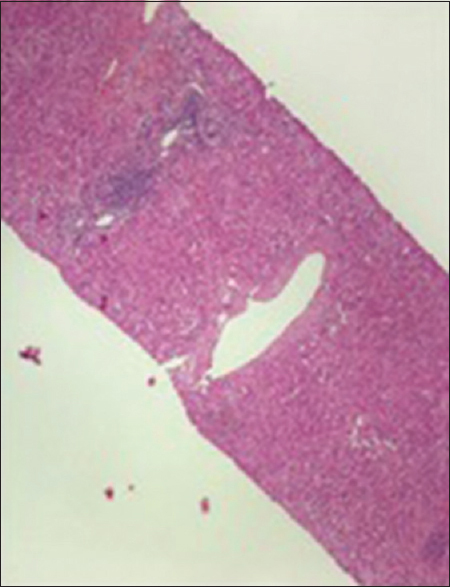 CP is defined as necroinflammatory changes around terminal hepatic venule and surrounding liver parenchyma. CP may represent an intermediate stage before progression to irreversible CR [Figure 4]. The presence of CP is graded as severe rejection regardless of RAI score which could be low as 4, 5 or so but requires urgent intervention. Herpes – Areas of confluent necrosis with hepatocytes showing ground-glass nuclei and multinucleation. Vascular complications after liver transplantation include hepatic artery, portal vein, and hepatic vein stenosis and thrombosis. Hepatic artery complications are the most common vascular complications and occur in 5%–12% of adult liver recipients. Biliary complications occur in up to 10%–20% of patients after liver transplantation and remain a significant cause of posttransplant morbidity. Histological indicators of biliary cholangiopathy includes expanded portal tract with bile ductular proliferation and neutrophilic cholangitis along with cholestasis. CK7 will highlight bile ductular proliferation along with several regenerating hepatocytes [Figure 5]. Diseases that reoccur the following transplants are hepatitis C (>90% cases), primary biliary cirrhosis (20%–50%), primary sclerosing cholangitis (20%–30%), AIH-Autoimmune Hepatitis (20%–30%), nonalcoholic fatty liver disease (20%–40%), and hepatitis B (<10%). Major histological dilemma is to distinguish between reoccurrence and rejection, especially recurrent hepatitis C and acute rejection. Suggestive of hepatitis C virus reoccurrence: Portal tract shows mainly mononuclear cell infiltrate and occasionally lymphoid aggregate. 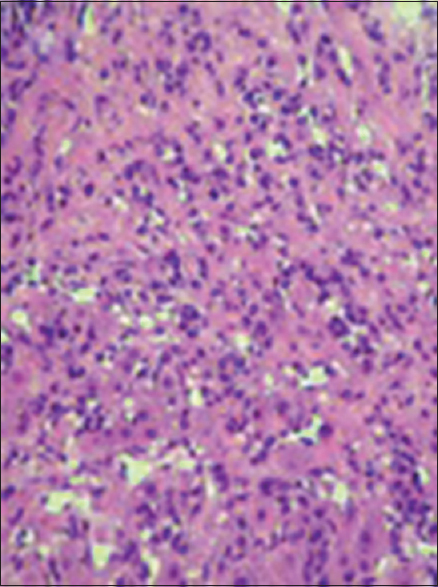 There is a predominance of lobular unrest with hepatocytes showing ballooning degeneration and frequent apoptosis. Rejection shows mixed inflammation in tract with quiet lobules or in late rejection CP [Figure 6]. CR leads to progressive graft dysfunction leading to graft failure. CR can be TCMR or chronic AMR. Features have been categorized as early and late chronic TCMR. Loss of small bile ducts (ductopenia) and obliterative vasculopathy of medium-to-large-sized arteries are important diagnostic findings [Figure 7]. Ductopenia is much more important finding as it is frequently identified in biopsy tissue. The ductopenia of TCMR is not accompanied by bile ductular reaction as opposed to biliary obstruction [Table 4]. Ductopenia in CR is called when there is bile duct loss in more than 50% of portal tracts. The absence of ductular proliferation or signifi cant periportal fi brosis helps to differentiate CR from other recurrent or de novo cholestatic diseases. The degree of fibrosis in chronic rejection is graded as [Table 5]. Chronic AMR being recognized as a distinct entity in 2016 Banff update. 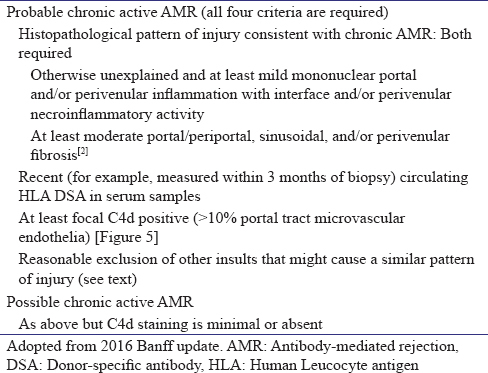 The criteria given for chronic AMR are shown in [Table 6]. Liver transplant pathology thus is a useful tool for guiding therapy. Early diagnosis can salvage the liver graft. Wiesner RH, Menon KV. Late hepatic allograft dysfunction. Liver Transpl 2001;7:S60-73. Siniscalchi A, Gamberini L, Laici C, Bardi T, Ercolani G, Lorenzini L, et al. Post reperfusion syndrome during liver transplantation: From pathophysiology to therapy and preventive strategies. World J Gastroenterol 2016;22:1551-69. Salah A, Fujimoto M, Yoshizawa A, Yurugi K, Miyagawa-Hayashino A, Sumiyoshi S, et al. Application of complement component 4d immunohistochemistry to ABO-compatible and ABO-incompatible liver transplantation. Liver Transpl 2014;20:200-9. Demetris A, Adams D, Bellamy C, Blakolmer K, Clouston A, Dhillon AP, et al. 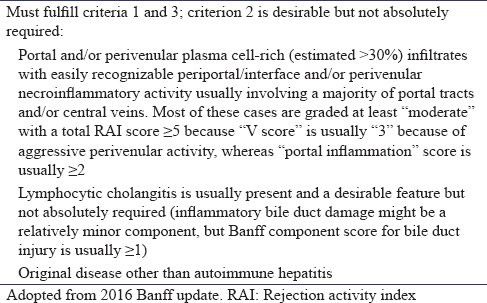 Update of the international Banff schema for liver allograft rejection: Working recommendations for the histopathologic staging and reporting of chronic rejection. An International Panel. Hepatology 2000;31:792-9. Akamatsu N, Sugawara Y, Tamura S, Keneko J, Matsui Y, Hasegawa K, et al. Late-onset acute rejection after living donor liver transplantation. World J Gastroenterol 2006;12:6674-7. Meru N, Davison S, Whitehead L, Jung A, Mutimer D, Rooney N, et al. Epstein-Barr virus infection in paediatric liver transplant recipients: Detection of the virus in post-transplant tonsillectomy specimens. Mol Pathol 2001;54:264-9. Razonable RR. 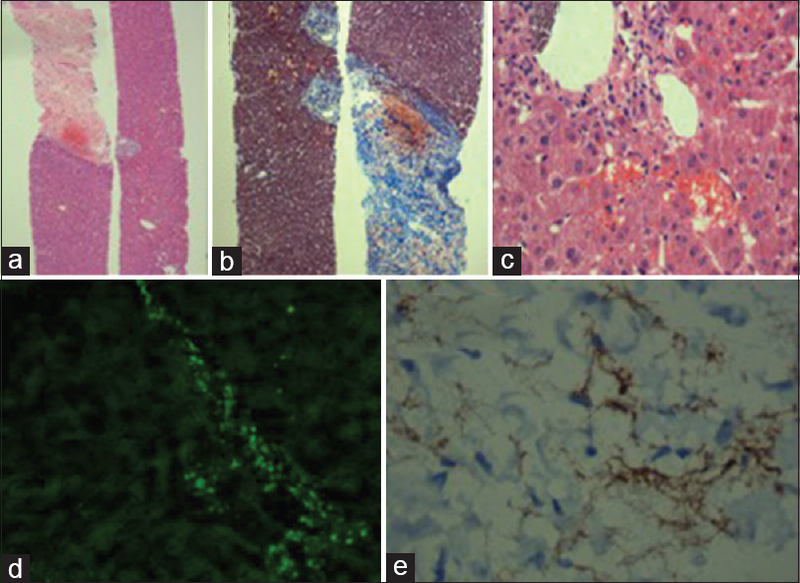 Cytomegalovirus infection after liver transplantation: Current concepts and challenges. World J Gastroenterol 2008;14:4849-60. Hübscher SG. What is the long-term outcome of the liver allograft? J Hepatol 2011;55:702-17. Demetris AJ, Bellamy C, Hübscher SG, O'Leary J, Randhawa PS, Feng S, et al. 2016 comprehensive update of the Banff working group on liver allograft pathology: Introduction of antibody-mediated rejection. Am J Transplant 2016;16:2816-35. Bansal N, Rastogi M, Wadhawan M, Vij V, Kumar A. Retrospective analysis of post-transplant liver biopsies – From diagnosis to therapy – Can we guide further? Experience from a tertiary care center in India. Indian J Transplant 2017;11:138-42. Bansal N. Liver Biopsy Made Easy. 1st ed. New Delhi: Jaypee Publisher; 2016.